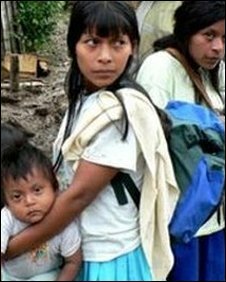 Twelve members of the Awa Tribe in Colombia were massacred by armed men, according to news reports. The early morning attack on the Gran Rosario reserve resulted in the deaths of seven adults and five children. Authorities are searching for information about the identities of the assailants, who may be connected to rebel groups and the drug trade. Earlier this year, 27 members of the tribe were killed in skirmishes with a rebel group.